After much experimentation, I have developed a pickup that is specifically suited to amplifying the harp. Most other methods of capturing the sound of the harp fall short in some manner. What is needed is a device that simply captures the vibrations of the strings. The strings carry the full sound of your harp, but they have a very small surface area and don't radiate well enough to be heard directly. To capture these complex vibrations a pickup must be very sensitive to the strings, yet remain relatively insensitive to the "housekeeping sounds" of the harp- pedal movements, tuning wrench noises, the inadvertent bump against the body of the harp, and of course feedback. The Kortier harp pickup does all this, and sounds great. Here is how the system is put together- the Kortier pickups contain a small piece of piezoelectric material which is encased in a protective resin housing. This piezoelectric material emits an electric signal when vibrated by the harp string pressing against it. To protect against hum in the system, the signals are transferred by a coaxial wire terminated by a coaxial connector. These connectors snap onto matching connectors on a common buss strip which is also fully shielded. 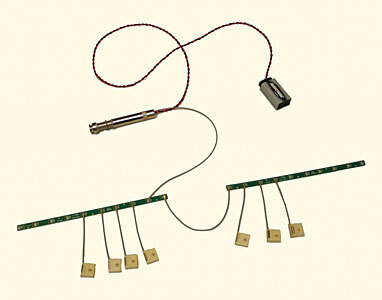 The buss strips are in turn connected together by coaxial cables to form a single complete circuit. The output jack has a preamplifier built into it and this also has the same UMCC coaxial connector preinstalled on the input lead wire. It is snapped onto the common buss wherever convenient, and the combined sound of all your strings is sent out to your sound system or recording device. The preamplifier is powered by a 9 volt battery which lasts for an estimated 1,000 hours of use. 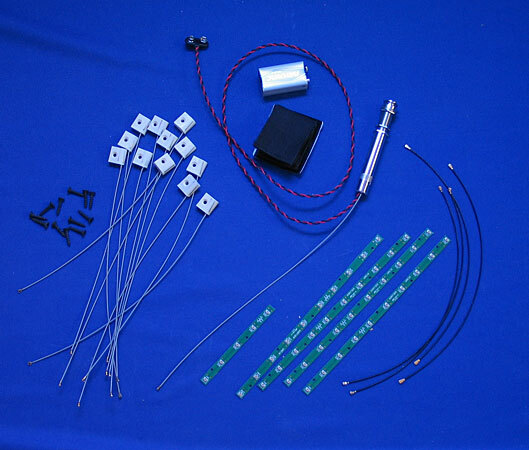 If you are a DIY sort of person, technically inclined, I will sell you a package including all the parts necessary to install pickups on your harp. 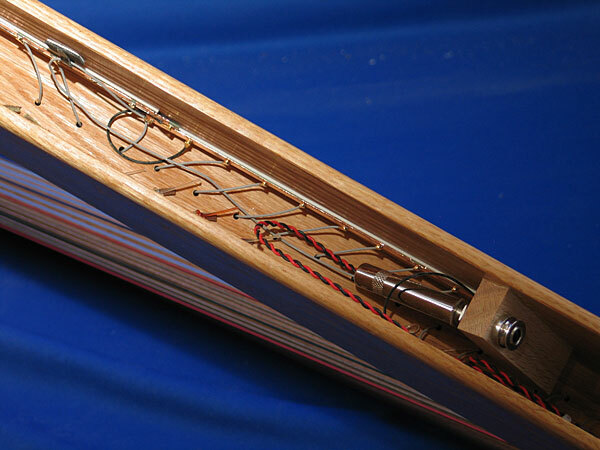 You can build a solid body electric harp from scratch, retrofit an existing electric harp that is not working up to the task, or install the package on an existing acoustic harp to make it into an Acoustic/Electric harp. The process will not change the acoustic functioning of your instrument. The complete cost for a 36 string harp is $600, or $800 for a pedal harp. This includes the 36 or 47 pickups, all necessary wiring, a Fishman preamp, and shipping to you. Additional pickups are $12 each, additional preamps are $100 each (If you wish to separate your string band into zones.). In order to install the pickups on your harp you will need to drill a 3 mm hole (1/8 inch) through your soundboard next to each pickup. This does not appreciably weaken the soundboard, but you must decide whether you are comfortable doing this or not. I give no guarantee, but I have never had a problem. The wire coming from each pickup already has a very small coaxial connector attached to it. UMCC is the technical name for these. This connector will pass through the 3 mm hole into your harp, and it snaps onto a mating connector on the connection strip which you will mount inside your harp. These connector strips can be fastened in place using foam mounting tape. The connector strips are, in turn, connected to each other using cables with the same UMCC connectors..The Fishman Powerjack preamp has this same connector preinstalled, so you can snap it to your array of pickups. The pickups and the preamp can be snapped on at any point that is convenient on the connector strips since they all feed into the same common circuit. The preamp is powered by a 9 volt battery, which you will mount inside the harp in the supplied velro pouch. As mentioned above, you can separate your strings into more than one area by purchasing another preamp for each additional section that you want. 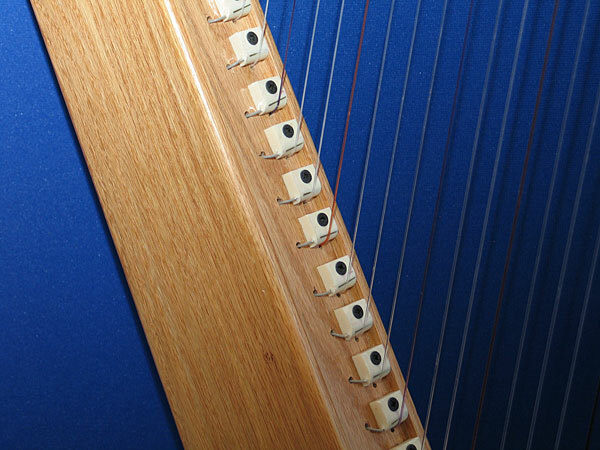 However, most harps work best by simply connecting all the strings into one circuit, with one output jack. To purchase, go to my Purchase Page, click here.